All transactions are safe and secure with a reliable history in online purchasing behind each of our associates. 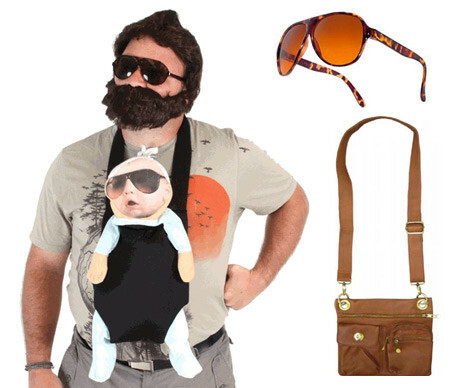 Buy The Hangover Costume Beard, Alan's Sunglasses, Satchel to own Hangover clothing and merchandise. Be the star of your wolfpack with this Hangover costume beard and accessories, including Alan's sunglasses from the movie and the satchel (aka man purse). Create the ultimate Zach Galifianakis costume for yourself or the fan in your life. Wear it whether you travel to Vegas, Bangkok or just to the local supermarket. It's perfect no matter where you go. Use Alan's satchel to store your pepper in case you stumble upon Mike Tyson's tiger. You wouldn't want to have to feed it cinnamon. Tigers hate that. In addition to The Hangover Costume Beard, Alan's Sunglasses, Satchel above, browse the Hangover Clothing Gallery for more apparel like men's and women's clothes, kids shirts or hoodies.